"This marinated grilled chicken is not only fast and easy, it's also budget-friendly and kid-approved! Serve with lime wedges and pico de gallo." See how to make Dr. Baker’s famous Cornell chicken. It's not necessary to use a whole chicken. You can use only legs and thighs to save money or whatever your local supermarket has on sale that week! This is great for skirt steak and pork as well! 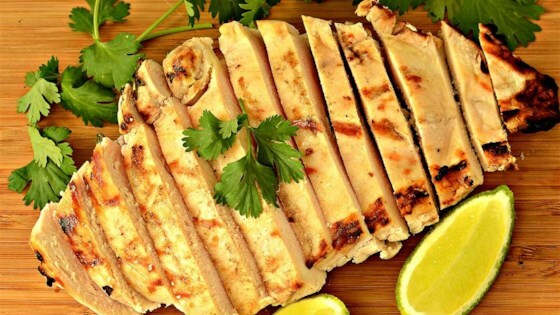 Marinating is not necessary if you are in a hurry; just toss your chicken in the mixture and place on the grill. If you do not have a grill, bake chicken in a preheated 350 degrees F (175 degrees C) oven until no longer pink at the bone and juices run clear, about 30 minutes. An instant-read thermometer inserted into the thickest part of the thigh, near the bone should read 165 degrees F (74 degrees C). I use blsl chicken breasts and marinaded them for 24 hours. The only change I made was to add sliced onions to the marinade. This is easy to make and the lime flavor comes through well. I added a little tequila. Was fabulous! No offence but this is barely a recipe. It's basically chicken with lime squirted on it. I'm sure it's good, though.